Likud lawmaker Avi Dichter appears to have gone back to his days as an officer in Israel's Shin Bet internal security agency. 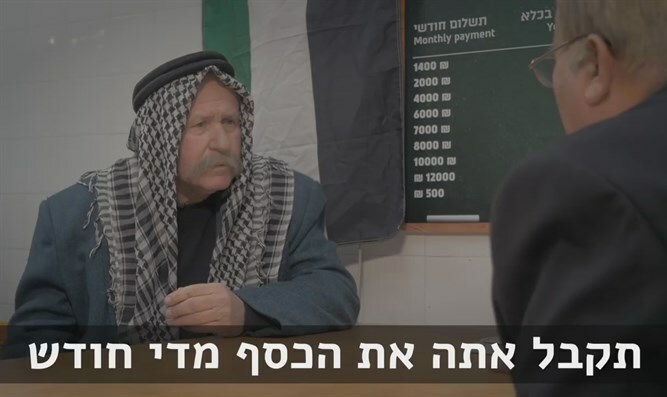 A former head of the Shin Bet, Dichter showed off his fluent Arabic in a new campaign video he released on Thursday that highlighted his successful efforts to pass a law punishing the PA for payments to terrorists. In the clip, Dichter is seen donning a fake mustache and Kaffiya in order to go undercover as a Palestinian in Ramallah, where he meets with who is ostensibly PA President Mahmoud Abbas. Dichter asks Abbas where he can find employment for his son, to which Abbas answers that he can become a terrorist and merit monthly payments from the PA. The PA leader then shows Dichter the various levels of compensation terrorists who killed Jews are entitled to. "Your salary goes according to the years you spent in jail." 'Mahmoud Abbas' tells Dichter. "The wall's have ears. The [fun and games] are over " responds Dichter. "What did you think, that you would continue to pay salaries to terrorists while the State of Israel continues napping?" Dichter then goes on to exult in his success in passing the 'Pay to Slay Law', which enables the Israeli government to withhold tax funds to the Palestinian Authority as long as the PA continues to pay salaries to terrorists who attacked Israeli citizens. The bill, which was co-sponsored by Dichter and Yesh Atid MK Elazar Stern, passed in its second and third readings in July by a vote of 87-15.